There's some buzz going around about Hurricane Irene. I'm hearing about impending cancelled flights and folk are scrambling to change their travel plans. Oh [bad word here]. I just got to DC yesterday afternoon after struggling with United and their cancelled flights and there's still a whole nuther action packed day of BlogPaws '11 tomorrow. Word on the street is that if you don't get out of DC by noon tomorrow, then you're in it for the long haul. I have absolutely no plans to change my flight, I say. We're going to skip out of here on a 10ish flight tomorrow night. And it's that simple. Don't be jazzing me up with all this hurricane talk. I've been looking forward to this whole conference for months and it was just way too much like work just to get here yesterday. So yeah. During a break in my hotel room, I turn on the news channel. See the projected hurricane path in all its glory. The Husband calls with his concerns. My resolve starts to melt. ugh. My peripheral vision catches a paper as it's slipped under my door. The hotel bill, I think. But no, it's the emergency procedures in case of a power outage in the hotel. Power outage? I'm on the 17th floor of the Sheraton. Keep my late night flight tomorrow and risk it being cancelled. I could finish the conference. But I could also be stranded at the airport. For who knows how long. With a dog. Change my flight to a Sunday departure and risk it being delayed until Monday. That means I'm toileting a dog in 70 mph hurricane winds (aim downwind, Yax honey). And let's not forget the power outage warning. Leave DC tomorrow afternoon to get Yaxley and me home safe and sound. Alrighty then. United.com, here we come. Fine, we'll catch a flight out tomorrow early afternoon, darn it all. But tonight is ours. Yaxley and I decide to make the most of it. We're going to the movies! 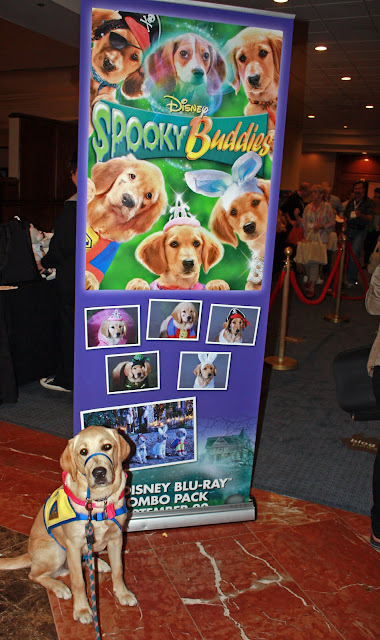 Yax and I are off to see a premiere showing of Disney's Spooky Buddies. 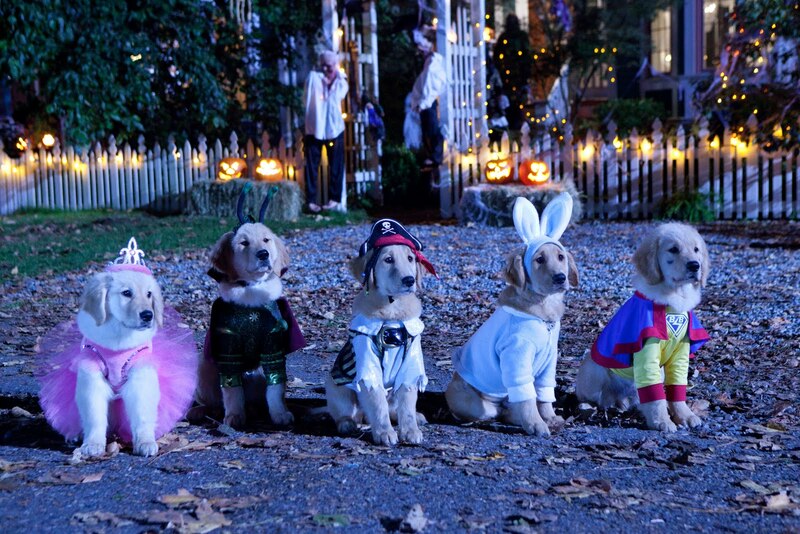 Five golden retriever puppies in a Halloween adventure. Dressed in costumes! Score! 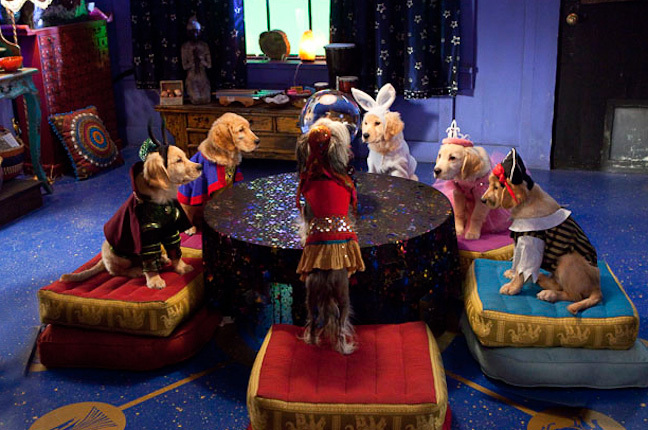 Spooky Buddies is the latest in a series of puppy adventures. Now how did this get past me? How could I not have known about the Buddies franchise? 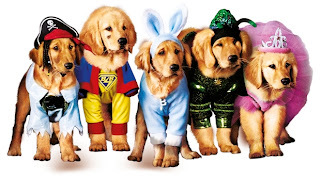 These are talking golden retriever puppies, for goodness sakes. Check your glucose levels, folk. We're headin' for a sugar rush. B-Dawg, Budderball, Rosebud, Buddha, and Mudbud. Ridiculously adorable, the whole lot of them. Now I've survived sitting through some rather horrific kid movies (any Pokemon moms out there?) and have even taken a CCI pup to see a film. But I've never been to a movie where the audience interacted by barking at the on-screen action. Now people, that's what I call a good time. While Yaxley and his new corgi friends were sharing a nylabone, other dogs were watching the pups on screen and wanting to join in on the chase. Silly and fun. No thoughts of Hurricane Irene for a couple of fully entertaining hours. The writer/director, Robert Vince, was on hand afterwards for a Q&A. Ah, I'm in. I think I'm in love with these Buddies. Nieces and nephews be forewarned; guess what you're getting for Christmas? No, not a puppy. DVD's, kids. As if things couldn't get any better, the Disney folk brought in a golden retriever pup in B-Dawg's character. Live and in fur and available for a photo op. Completely jazzed, Yax and I took a number and stood in line only to find out that the photos are with people only. Sadly, no dogs allowed in with B-Dawg. And since the camera insists on adding fifty pounds on me in every photo, we gave our regrets. But you guys have to see this puppy. Just look at this, let your mind drift. You can almost smell the puppy breath from here. 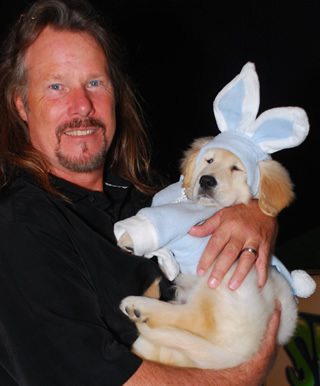 Animal handler, Mark Forbes, with B-Dawg. Oh, and yeah, that guy is the animal coordinator for the Buddies. That's Mark Forbes, a much in demand animal handler in the film industry (Dr. Doolittle, 101 Dalmatians). Sure, he's a famous guy and a pretty nice fellow, too. And that's why I won't hold the no-dogs-near-the-puppy rule against him. But still. Yaxley is just a bit unhinged about all the cooing over the bunny ears and all. He is insistent on maintaining his honor as the best looking dog in the room. Any room, he says, it doesn't matter. He needed the photo op to prove his point. So we get one better. Yax puts his good looks up against all five golden retriever pups, plus a ghost beagle. at the puppies, now back to me. in the rain, they could smell like they're me. Next post - chased home by a hurricane. Ok, so it's come to my attention that not everyone gets my Old Spice Guy reference in the Yaxley photo caption above. This, my friends, is where I was going with thought. Hello, ladies. Look at your man. Now back to me . .
Well played, Old Spice ad people. Still makes me laugh. I got to meet Yaxley at Blogpaws. What a sweetheart! Don't worry Yax - those puppies have nothing on you! Hey, you can work on "speak" without anyone caring!! Good luck on getting back early...wise decision. Terrific post...I did not have my fur buddy with me :( ...so I was free to tempt the fates. But coming from Los Angeles, I had somewhat less to worry about. Glad u got to enjoy the movie night out with your baby Yaxley. Hope to meet at another event sometimes.